Infinite Art Tournament: Element of the Month: Francium! Francium, Element 87, is not one of the inherently fakey elements, although it is sometimes arrived at through fakey means. It is, however, a transitory mayfly of an element, coming in three flavors ("isotopes," if you will) with half-lives of between about five and twenty-two minutes. Atoms of it pop into being due to the natural decay of uranium or thorium, strut their brief hour on the stage, and then shed alpha or beta particles to become atoms of Radon or Actinium. At any given moment, all the Francium on Earth would be roughly equivalent to the mass of your thumb. You are probably never going to have any Francium in your Elements collection. Not for long, anyway. Because of the uncanny cleverness of Dmitri Mendeleev and his periodic table, it was fairly clear for decades in advance that there would be an Element 87. Clever chemists and physicists went looking for it, using a variety of techniques. D.K. Dobroserdov, from Russia, thought he had discovered "Russium," but he was wrong. Fred Allison, from Virginia, thought he had discovered "Virginium," but he was wrong too. Horia Hulubei, from (then) Moldavia, thought he had discovered "Moldavium," and might well have been right. But it is Marguerite Perey, from France, whom most referees credit with scoring the first unambiguous sighting of "Catium," in 1939. People thought that "Catium" sounded silly, though, so Perey's discovery got renamed to honor her country, even though there already was an Element (Gallium) with a name that honored her country. If you imagine the mass of your thumb being spread more or less evenly throughout the entire planet, you will realize that there aren't any major concentrations of Francium around. Amounts of up to a couple hundred thousand atoms have been briefly synthesized, but there has never been enough in one place for anyone to know for sure, for instance, what it looks like. The odds are, as regular readers would expect, that it would be a silvery metal. 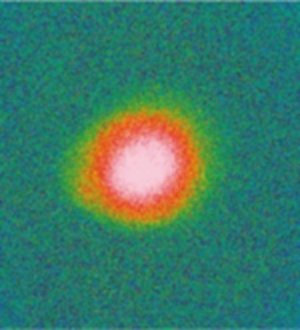 An image of the glow produced by 200,000 sythetic Francium atoms. There's an minor internet meme out there about how you can get a big explosion by tossing a few grams of Francium into water. Having got this far, however, we can see the essential silliness of this idea: regardless of the theoretical truth of the assertion (fairly low, I think) it is a non sequitor: there's no such thing as a few grams of Francium, and if there were you'd be in serious trouble long before you got the bucket of water ready. Commercial applications for Francium are, at present, considered quite limited within the human community.